Event Master Pro is a fully automated system for running your DJ business. It takes you through the process from start to finish, using the Check List as your guide to each step of the process. When the enquiry form has been submitted an automatic customized quote is emailed to the customer with a link to your brochure. Customer accounts can be manually or otherwise they are automatically created when the customer clicks the link to book online in the first email response. They are also created when an event is moved from ‘Open’ to ‘Tentative’ or ‘Booked’ status. If the customer books you will switch the Event Status to ‘Tentative’ to follow up and get a deposit. The application will send an email to the customer with the details on how to book online. When the booking form is received the event is automatically switched to ‘Booked’ and the callback date is cleared. At this point you can manually set a new callback date if required, perhaps for an appointment. 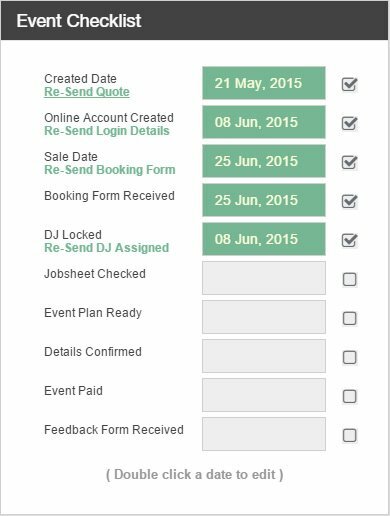 Once (or before) the customer confirms their booking you can assign a DJ and check it as ‘Locked’ which assigns the DJ to that job, sending them an email confirmation and reminder to log in and check the jobsheet. When the DJ checks the Jobsheet the application will leave the date on the checklist, ensuring that you know the DJ knows about the job. This is referring to the WP Plugins Bundle if you have it installed and is to verify the event or music plan has been completed. Shortly before your event, perhaps on the Monday prior you will call your customer to confirm the booking details with them. Ensure the start time and address is correct and the music plan is ready before you notify the DJ to check the Jobsheet again. Once completed you will check a box ‘Details Confirmed’ which will send the customer a booking confirmation and the DJ a notification to check their Jobsheet for any updated details. Once details are confirmed and payment is collected, the customer will receive a notification of their successful payment. As soon as the Event Date has passed the application will automatically switch all the events to ‘Done’ status and sends out the Feedback Form link to be completed. The Feedback Form link will automatically log customers in to make it easier to leave feedback.